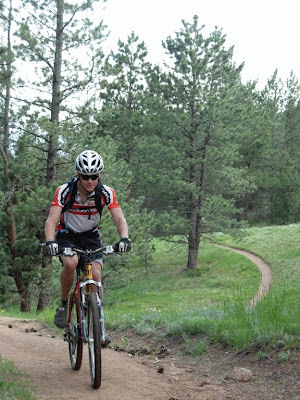 Last weekend was the 7th annual Lyons Fat Tire Festival, hosted by Redstone Cyclery of Lyons Colorado. Two days of truly excellent mountain biking, epic death-march type stuff with over 4,000 feet of climbing. Awesome. The event has been thoroughly recapped here and here so I won’t bore you (me) with a play by play description, but I wanted to touch on the highlights. Because really, this was pretty damn cool. So um, here are the take aways. Biking is good. Climbing is hurty good, and descending is fast. Swoopy is fun. Girls are soft and pretty (technically that’s more of a life take away then a biking take away, but sometimes soft and pretty girls bike). Dale’s Pale Ale is the perfect post ride beverage. Biking is good. That pretty much covers it I think – but if you didn’t get enough you can checkout my image gallery for pictures!